Despite reported shortages of teachers world-wide, around 50% of teacher education students do not establish themselves in the teaching profession. It is therefore important to confirm the career pathways these students undertake and that teacher education degrees are of benefit to them throughout their career. 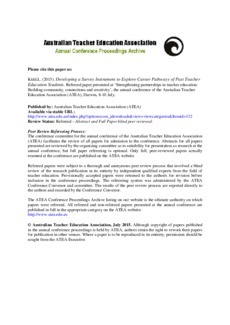 This paper describes the method used to construct the survey required for the larger study that will explore the career pathways of past teacher education students. Developing the new survey was simplified by identifying and adapting questions from established surveys used in previously published projects. Demographic questions and those related to motivations, career pathways and occupational reflections were categorised into themes for further consideration. The majority of the questions in the new survey were from the established surveys, some of which were re-worded to better suit the purpose of the larger study, and additional questions were included where required to ensure the research questions of the larger project were answered.